Niclas Müller-Hansen of Sweden's Metalshrine recently conducted an interview with keyboardist Jordan Rudess of progressive metal giants DREAM THEATER. A couple of excerpts from the chat follow below. Metalshrine: Did you make any new discoveries about songwriting on this latest [self-titled DREAM THEATER] album? Jordan Rudess: Well, we kinda discovered that it is possible to take the DREAM THEATER style and kinda bring it into more concise format and still have it feel like it's us and that it really works. That was an experiment. In the history of the band, we've tried to bring certain songs a little bit more tight and on this album more so. So we can see that it works. Metalshrine: With a band like DREAM THEATER, is there ever a limit to how far you can stray from the sound you're known for? Or do you always have to keep it within the DREAM THEATER boundaries, so to speak? Jordan Rudess: The stylistic window. First of all, DREAM THEATER is a fairly wide stylistic world and there are a lot of things that can be included, be it a little honky tonk thing or a slightly jazzy thing, so there are many possibilities. There are certain things that really don't go or don't fly inside the DREAM THEATER window. The best example of a band that completely does what you're referring to is RADIOHEAD. They create these songs and then next thing they're an electronic band doing weird stuff. DREAM THEATER does not work that way. We've worked very hard over the years in creating this window of parameters and it's kinda a common ground for all of us as musicians to create this particular kind of music. An example is that many years ago, I remember I had just gotten an amazing percussion library of native instruments called Battery with great electronic drum sounds. I came into a DREAM THEATER writing session and we started off jamming and I was playing these really cool sounds and we had a great, great jam and it was really funny and we all ended up laughing at the end, which was really cool. I remember [former DREAM THEATER drummer] Mike Portnoy saying, "That was amazing, but we could never do anything like that!" It was just too different and too odd. Metalshrine: You mentioned in an interview I read, that [drummer] Mike Mangini brought mathematics into the band. Can you explain that? Jordan Rudess: Sure. I'm still learning about it myself. I always thought of strange rhythms as a bunch of 3's and 2's. Usually you can divide things in 2's and 3's and some kind of combination in the accents therein, but when I started working with Mike, he thinks in large numbers. He thinks in 19 against 5, so what I understood in working with him, is that he has a very unique mathematics brain. He's like a genius when it comes to numbers relating to musical patterns. He was able to bring some of that into our war games. What's cool is that he can introduce some kind of mathematical idea and then John [Petrucci, guitar] and I can take it and use it and make notes and make music out of it. It's a very interesting addition to the DREAM THEATER world. It's fascinating and it's really cool. We come up with some stuff that I would never come up with myself, because I don't think like that. Metalshrine: How do you feel about the music business? Are you optimistic or pessimistic? 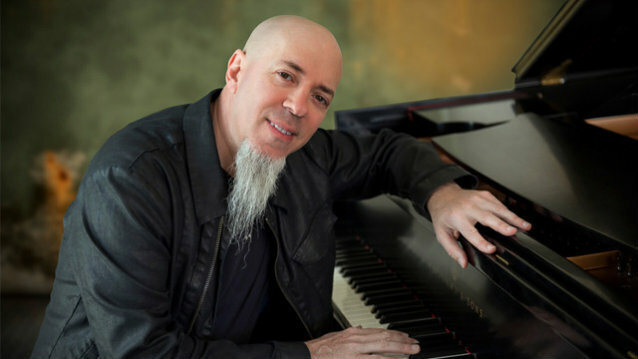 Jordan Rudess: I would say that I'm excited about it from one point of view, being someone who enjoys technology and appreciates all the different ways of discovering music and to get music out there and the fun things you can do within the social media aspect. That said, I can't help but be really upset about the fact that it seems harder than ever for a young band to make it. Maybe it's because there's just too much stuff and too many ways and people get lost and don't know where to look for a band. It's such a wash of stuff and you're looking at this service and that sevice, Spotify and Bandcamp. And you hear about the kinda money some of these streaming services pay the musicians and it's really, really concerning. I have Spotify and I listen to it and I think it's really cool, but as an artist starting out, that's really upsetting. The world, the industry has to rethink how that's going. It's not gonna allow creative musicians to survive. It's easier to get the music out there, but how are you gonna make money off of it and how are you gonna get anywhere? Everybody I talk to is basically saying or agreeing that it's just harder.